Yesterday was the latest meeting on the East Mids Modern Quilting Guild, but as we were getting ready for our wall removal, and renovation, I couldn't commit to spending the day out! Oh well, after spending the morning shopping for Range cookers (not an easy task with a very tired and obstreperous 4 year old in tow) and a large part of the afternoon packing away a load of our stuff (again), I managed to fit in a few hours of sewing. 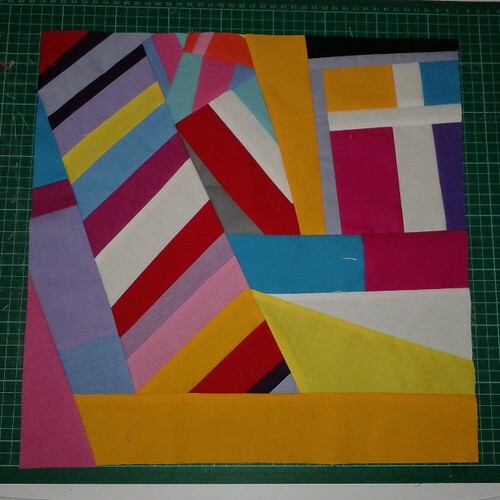 I started off with this block (15 whole inches) of Improv for the lovely Amy, at Amy's Crafty Shenanigans, it is a couple of weeks late, but I am hoping Amy will forgive me for my tardiness! Amy is a recent member to our lovely group, but it seems we've all fallen a little flat over the summer and been a little distracted, and fallen behind, hopefully we can all get back on track soon. 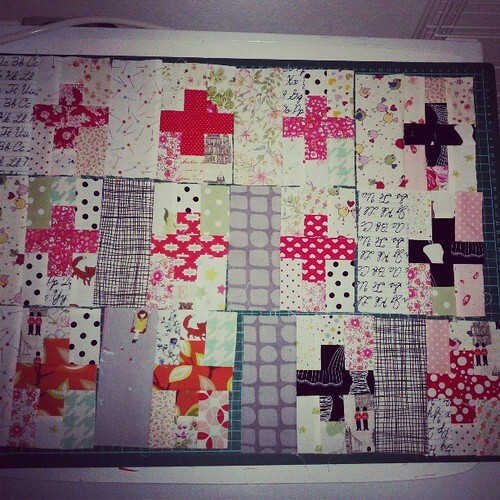 And then as I had a little more time (well I avoided cooking dinner), I did some chain piecing and threw together these blocks, for my own quilt, so only about another 300 of these to go, yay, might be done for Christmas 2020, maybe! Where on earth did you find the space to sew if they are knocking the wall out?! Well done you for producing such nice work in the circumstances. That improv block is brilliant!! Totally forgiven - it is a super-awesome looking block!!! And I REALLY hope the group perks up a bit - it is so far the strangest bee I have ever been in! Love the improv block and crosses look fun too!